Abu Dhabi, UAE – The new Rolls-Royce Phantom Series II has officially arrived to the Middle East after having been revealed for the first time in the region at Abu Dhabi Motors, the sole dealer for Rolls-Royce Motor Cars inAbu Dhabi and Al Ain. The famous words of Sir Henry Royce-“Strive for perfection in everything you do”-have once more echoed through the hallways of the home of Rolls-Royce in Goodwood, with the production of the Phantom Series II family, which projects a more informal presence with a greater emphasis on driving. The new car has been thoughtfully updated through introducing cutting-edge technologies and enhancements to an already peerless drive train. As a consequence, the new Rolls-Royce Phantom family Series II is a modern interpretation of the classic timeless Phantom design. 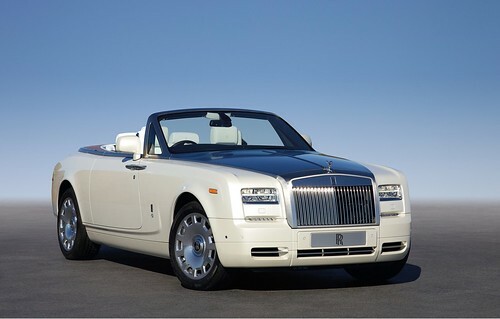 The cars take the core values of Rolls-Royce and create a contemporary effortless luxury. Achieving a new dynamism while remaining true to the brand heritage. The Phantom’s striking new front-end, with re-styled bumpers and rectangular light apertures, perhaps best encapsulates the essence of the significant changes that lie beneath. The Phantom Series II features new driver assistance technologies and a modern user interface with a re-designed multi-media controller, an 8.8 inch control centre display and a front, rear and top-view camera system that further augment ease of maneuvering. The new 8-speed automatic gearbox and rear differential enhance the already exemplary driving dynamics perfectly complementing the V12 direct injection engine. Fuel consumption improves by 10 per cent on the combined cycle and CO2 emissions fall from 388 to 347 g/km as a consequence. The Phantom Series II is a modern execution of timeless Rolls-Royce elegance, which widens its appeal beyond the purely traditional but retains the core values that make the Rolls-Royce marque unique.